Unisa has partnered with the national Department of Science and Technology during National Science Week to promote the study of science amongst South African youth. The university chose the opening day of National Science Week to launch its state-of-the-art Science Campus, highlighting its commitment to African knowledge production, and the education of the country’s future scientists. Science, engineering and technology have been identified as areas where there is an acute shortage of skills in South Africa and which must receive urgent attention in terms of promotion as the new focus in both basic and higher education. Unisa intends to be a key role-player, hence its investment in building a campus, situated in Johannesburg, with state-of-the-art facilities to enable the teaching of science in a world class environment. “Unisa’s contributions to the growth and development of South Africa, the continent and the world over this period are incalculable, especially in terms of our graduates and their impact and influence throughout the world,” said Unisa Principal and Vice-Chancellor, Prof Mandla Makhanya at the official opening of the campus. The Vice-Chancellor said that Unisa was dedicated to advancing knowledge production by, and for Africans, and this campus was intended to grow research capacity and support research in the fields of science, engineering and technology, and in the agricultural and environmental sciences. “The cutting-edge facilities will provide the space for staff and students to grow and develop – to match theory and practice and to translate theory into practice. Unisa is aware that this is not an investment that one would consider typical for an open distance learning (ODL) institution, said the Vice-Chancellor, “but in our view it makes perfect sense in that these facilities, combined with our open, distance and e-learning (ODeL) business model and our strategy going forward, will take all of the benefits inherent in ODeL to a new level”. The Unisa Science Campus is an innovative conglomeration of buildings and facilities, comprising 12 different buildings, a library, two auditoriums and a large study area. Each has been given a name that reflects the diversity and richness of the sciences and those who have influenced its course and shape since its genesis. The names are also symbolic of Unisa’s commitment to inclusiveness – to the embracing the diversity and collective heritage of Africans. Hanekom also addressed the importance of bridging the gap between science and society, and said the campus points to the potential for a curriculum to be developed for the effective communication of science. The absence of such dedicated programmes, he said, would not benefit South Africa and the country would remain with a weak science awareness and engagement programme in the country. 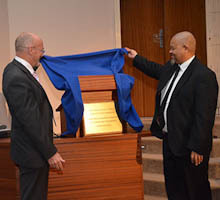 Image 1 – From left: Derek Hanekom (Minister: National Department of Science and Technology) and Prof Mandla Makhanya (Unisa Principal and Vice-Chancellor) unveil the plaque celebrating the official launch of the Unisa Science Campus, Johannesburg. 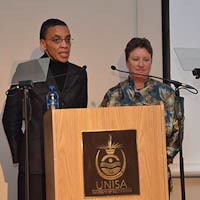 Image 2 – From left: Prof Gugu Moche (Executive Dean: College of Science, Engineering and Technology) and Prof Maggi Linington (Executive Dean: College of Agriculture and Environmental Sciences) introduced the new names of the Unisa Science Campus buildings.